This is an introduction to the in-depth series of articles and its author, Dr Floor Anthoni of the Seafriends Marine Education Centre in Leigh, New Zealand. The Marine Conservation Centre was established to make people aware of the plight of our seas. Not only New zealand's seas are deteriorating, but elsewhere in the world the situation is often far worse. Thus the idea to write a web site was born, a resource that could be reached with only a few clicks from anywhere on this planet. Indeed most of this web site's visitors come from the United States. But it takes some twenty years to complete! The In-Depth series of articles hopes to react to current events as they occur, on a level that is suitable for schools. The seas around New Zealand are deteriorating at an alarming rate. Not a week passes by without some alarming news about the state of our sea appearing in the daily newspapers. It seems that we've entered a new era in which we've overstepped the limits of the services the sea provides, such as food, converting our wastes and cleansing the coasts. Not only do we need the sea, but the sea needs us as well. It is time for a radical change in attitude, understanding and action. But what can we do? What is going on down there? How are we able to understand the problems so that we can do things right? It is human nature to place oneself at the centre of the universe, bending and adapting the natural environment to suit only oneself. In times of plenty, the ill effects of such selfish behaviour are hardly noticeable. However, as the resources diminish, all the wrongs of the past and present suddenly become apparent. It is also human not to be too concerned about the future but rather to over-emphasise the present and its short-term benefits. It has something to do with our brain, that one cannot see what is changing slowly. We fail to anticipate what might happen as a logical consequence of our actions. When changes occur slowly over many generations, as happened only half a millennium ago, it was not important. But today, changes are happening so fast and so profoundly, even within one generation, that we need to be more visionary and be more aware of the environment around us and learn to understand it better. In 1990, after over a thousand dives in New Zealand waters, it became clear to me that the seas were deteriorating at an accelerating pace, but nobody seemed to care. I decided then to devote the rest of my life towards fighting for our seas. As a first step, the Seafriends Marine Conservation and Education Centre was built, entirely from our own savings. The old shearing shed was converted into a restaurant with aquariums and dive hire underneath. The restaurant is our classroom during the days that schools visit us. In only a few years the centre has become a success with over 3000 students visiting each year, for a day of marine education. 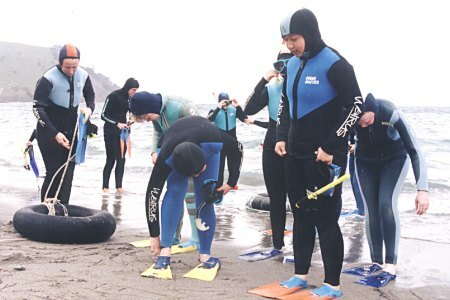 Going into the sea with snorkel and mask is the main attraction but lectures about the plight of the sea, also showing the unexpected variety of organisms living in our seas, have become popular. Collecting information and taking photographs was the next priority, in order to be able to publish articles and to compose lectures and resource material. The Seafriends Library now has over 900 books about our environment and the sea. Anyone is welcome to hire its books. The photo library has over 10,000 images and both are still growing. The Seafriends Foundation was established to allocate funds from public donations. In 1997 our web site was created, growing steadily as more information was added. For example, the text of this article and all following ones can be browsed at http://www.seafriends.org.nz/indepth/. The library catalogue can be found at http://www.seafriends.org.nz/books/library.html. With the in-depth series of articles, I hope to open a world of understanding about our fascinating environment. I will write about the main global influences, about what makes NZ so special, about the sea which is such a strange world and about the many things that we are doing both wrong and right. I also like to comment on current topics and issues as they arise. Although each article has been thoroughly researched, the views and facts presented here are entirely my own and responsibility for mistakes and misrepresentation rests entirely with me. Readers are invited to comment on the articles by e-mail. School children about to enter the magical waters of the Goat Island marine reserve. During a guided dive with Seafriends instructors, children wear fully protective suits, which keep them warm, preventing cuts and bruises, and possible jellyfish stings. When dressed up like this, children cannot sink, which is an important safety factor. The floats made from inner tubes, show where the instructors are, while serving as floating platforms in case of difficulties. The situation of a world running out of resources can best be visualised with this simple diagram. Each box represents the entire resource (blue) and the part used (red). In a situation of abundance, where much less is used than the total available, doubling the resource use causes no alarm because plenty still remains. By contrast, the lower box represents a world of scarcity in which even a small increase in resource use leaves an ever more quickly diminishing quantity left over, while introducing problems that quickly worsen. Many of our environmental problems can be traced back to over-use. For instance, most of our fish stocks are managed deliberately in a state of scarcity. Many population ecologists furthermore believe that the world's population and resource use looks like the bottom box and that the coming thirty years of the new millennium will be accompanied by immense environmental and social problems. The Seafriends web site aims to make readers understand these problems.